Protect your valuable network infrastructure equipment from surges and spikes. 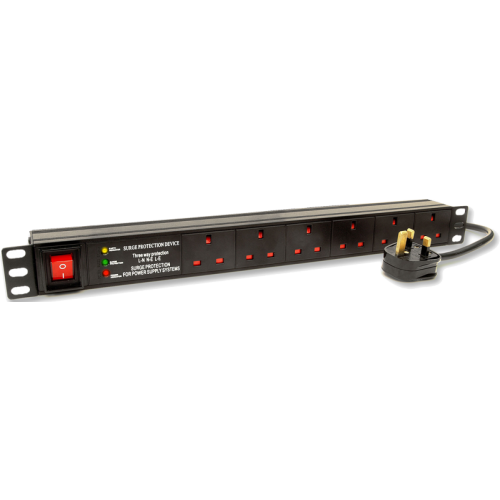 This power distrubution bar is designed to install into 19" rack systems and is ideal for projects or systems that prevent the use of full size UPS systems. Featuring the latest in Metal Oxide Varistor (MOV) technology, the SurgePro will block any input voltage surges up to around 4 times the nominal input voltage, meaning your IT Networking Switches, Servers, NAS devices and PBX devices will run for longer and thus reduce system downtime. Install alongside the RM7028-S to provide more than enough options for power and flexibility.